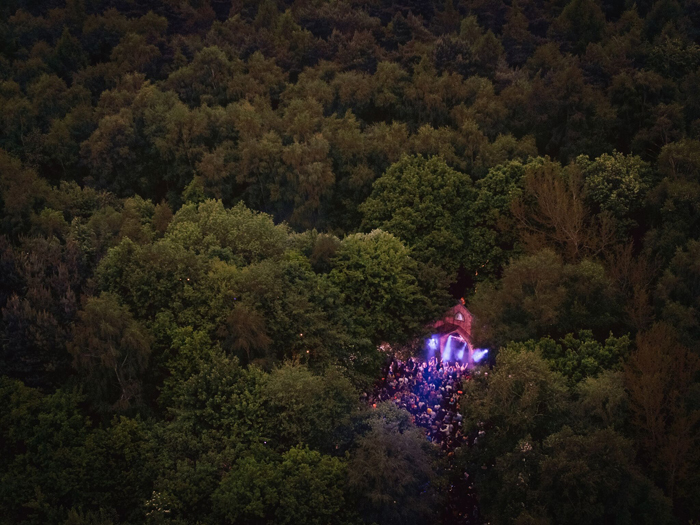 With a penchant for the theatrical and a site enclosed within dense woodland, Lost Village has fashioned itself as a remote enclave with a depth of immersion and breadth of experiences that amount to a unique proposition for festival-goers. Having sold out for its first couple of years, its third edition – set to take place from August 24 – 27 – promises to expand the territory of its programming whilst maintaining the same auspicious blend of music, comedy, wellness, food & drink, educational content, and imaginative design. Insights spoke with Jay Jameson, Director of Lost Village, about its production values, experiential elements, approach to curation and more. Festival Insights: Could you tell us about your background in the music industry and how it led to the creation of Lost Village? What were the key inspirations and ideas behind the event? Jay Jameson: We’ve always been obsessive music fans. Back in 2006 we started running parties together – they got really popular and our careers as artists quickly took off. Next thing you know we’re DJing around the world, broadcasting on Radio 1 and getting to experience all the best festivals and clubs firsthand. This meant when it came to creating Lost Village we’d done a lot of research – we were really in amongst it, so we had the perspective of the people on the dance floor, but we also knew all the things that were important to artists. Our main objective was to create something as original as possible; if most festivals were going left, we wanted to go right. FI: Lost Village presents itself as a sort of fantastical hidden retreat. Aside from the woodland setting, what else makes the festival more of an escapist experience than the average? JJ: When it came to Lost Village we wanted to do things that hadn’t been done before. We wanted to create something that really played with people’s minds. Something that totally detached you from reality and left you feeling like anything could happen at any minute. The event is really a large theatre production; the woods are transformed into a surreal world, we have a large cast of actors and, like a film, there’s a director. We have more in common with things like Secret Cinema and Punch Drunk than most music festivals; one day we’re booking artists the next we’re reading scripts and filming trailers. 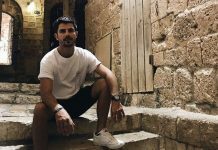 FI: As for the musical programming, the line-up seems to be expanding into slightly new territory this year as well as maintaining its house and techno core. An obvious outlier is having legendary hip-hop outfit De La Soul as headliners. Do you plan on keeping Lost Village predominantly dance music-orientated, or will it continue to encompass different genres as it grows? JJ: Very much so. Whilst our headliners were more dance music based in the first year, we also had other smaller areas playing funk, soul, disco and indie and actually these areas were really popular and felt right, especially in their more abstract moments. Year two we widened the music offering even further and many of the stand out moments were actually nothing to do with house or techno, so this year we’re pushing it further still. The one thing that connects everyone we book is that we’re personally passionate about them. If we’re not excited then we can’t expect anyone else to be, and this year we’re more excited than we’ve ever been. FI: The festival’s food & drink offerings will this year comprise a selection of global street food restaurants, Michelin star level Tribal Banquets, craft beers & ciders, and an Officer’s Mess restaurant courtesy of one of my personal favourite eateries, Honest Burger. Are you finding that increased demand from festivalgoers on this front is channelling more of your efforts into this area year-on-year? JJ: Honestly, we just want to give people the best experience on every level. From a business point of view, some might say this is our downfall, as we could cut corners and save money, but that’s not really what we’re about. We’re all very passionate about food & drink and Lost Village gives us the chance to demonstrate that. If by the end of the weekend you’ve experienced fine-dining at the Tribal Banquet, been to the Officer’s Mess Honest Burgers restaurant, eaten incredible street-food and had your mind blown countless times by all the other madness, then you’re probably going to come back for more. 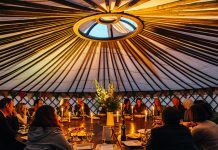 This year we’ve invited the chefs from some of our favourite restaurants: James Lowe from Lyle’s in Shoreditch, Lee Westcott from Typing Room and on Sunday with Richard H Turner, the head chef of Hawksmoor, we’ll be bringing the world famous Sunday roast to the Lost Village – it really is pretty exciting. FI: Rounding out the proceedings are the Lake of Tranquillity with its range of spa treatments; Forger’s Lane and its creative workshops; the extensive comedy line-up; and the Institute of Curious Minds which hosts talks, live interviews, discussions and team quizzes. Have these non-musical experiences been gradually added, or were they an integral part of Lost Village since its inception? JJ: They’ve always been there in some degree, but early on we wanted to check that people were genuinely interested and the whole thing wasn’t just a big vanity project. Thankfully it all connected and we’ve grown it year on year. We always wanted to attract a dynamic crowd that wasn’t just there to party 24/7, so offering a range of activities was integral to that way of thinking. FI: Great sound is obviously imperative for any music festival to be well received, and open-air environments can make that a difficult thing to achieve. Which suppliers do you work with in order to do justice to the artists you host across your stages? JJ: Most customers won’t walk away talking about the specifics of the sound, they’ll just know they had a good time and got lost in the music. In that sense it’s a dark art. Having the perspective of artists we know how vital it is from that side of the booth too. From the monitors to the main system, it has to be right. We work with Audile (who have recently merged with our lighting designers too, DBN). They’re involved throughout the production process and totally understand what we’re trying to do.